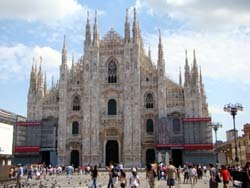 The presented room availability, rates and discounts are actual and final for all our 638 hotels in Milan. Church of St. Lorenzo is a truly striking religious attraction. Every year the church is visited by thousands of pilgrims. One of the greatest artists - Michelangelo – worked over painting and decorating the walls of the church. Church of St. Lorenzo has the full right to be considered one of the most beautiful churches in the world. The main relic of the cathedral, which is the object of worship of pilgrims, is a vessel with the blood of St. Lorenzo. Only one time a year the priceless relic is exhibited to the public. Pilgrims from many different countries come here to see the sacred item.